Enthusiasm, second only to the flu, has been the most highly infectious thing to hit Wanganui recently. It was the annual Permaculture weekend here in Wanganui a couple of weeks ago. Kelly and I hosted a solar oven and rocket stove demonstration near the Whanganui River during the weekend market. We had incredibly positive feedback and drew a surprisingly large crowd of enthusiastic locals as well as visitors during our two hour demo. It was great seeing so much excitement surrounding this straight forward, highly effective technology. 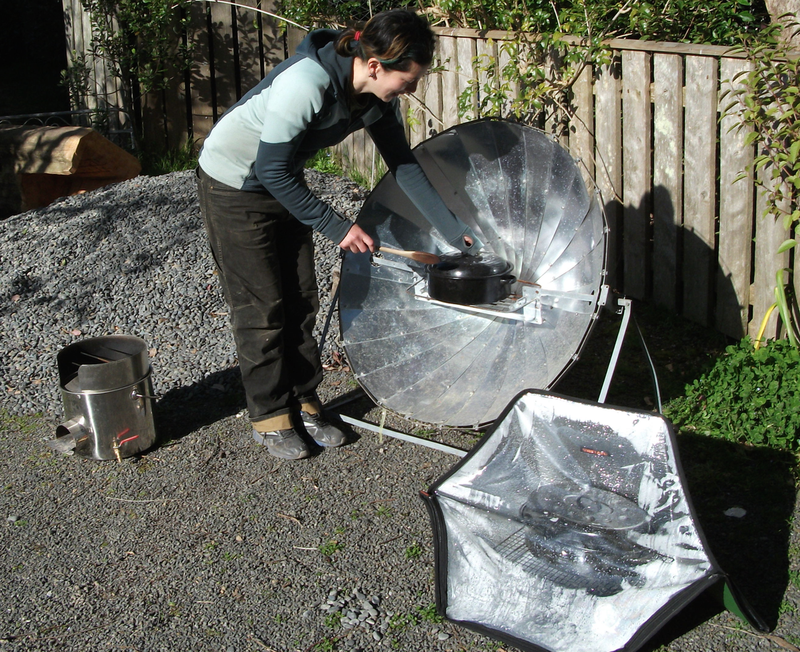 Both the solar oven and the rocket stove are wonderful for camping, summer days when you don’t want to heat up the house, emergency preparedness, as well as reducing your energy costs throughout the year. We also attended a fruit tree pruning and grafting demonstration conducted by Murray Jones where we learned heaps of useful information about keeping your fruit trees happy, healthy and productive. These things are achieved through attentive, and sometimes aggressive pruning, to insure the removal of all dead wood as well as branches that grow straight up or back into the tree, robbing it of nutrients that could be put into the fruit or productive new growth. Training branches to reinforce the desired shape (a vase in this instance) was also covered. Shaping your tree is done so that fruit is easy to reach and to insure that all areas of the tree receive ample sunlight. Additionally there is at least one more advantage, it becomes possible to stand inside the frame of the tree when pruning time comes around in following seasons. Murray also gave a brief explanation of why it is advantageous to perform bud thinning. This task is performed when your fruit tree is blossoming, you go through and pick a portion of the blossoms so that your tree will produce fewer fruit of a much higher quality. Also there are times when you will remove a specific blossom or blossoms from a cluster so that the fruit has enough space to fully develop. It was stressed that each fruiting species will have individual needs as to how and when to prune or thin blossoms, the focus of the demo was on apples, plums and pears. In addition to the pruning work shop we attended a community seed swap at the Quaker House in Wanganui. This was a really cool event and started off with each person introducing his or herself to the group of attendees and including a bit about their gardening history. As with the previous demos there was a really large and enthusiastic turn out. Experience levels ranged from seasoned veterans to novice level gardeners/farmers. Some of the seeds and plants available included fryer’s hat hot chili peppers, giant pink banana pumpkin, Jack be little pumpkins (whole fruit), zucchini, American Paw Paw, a large variety of corn and beans, sunflower, marigold, and even a Brazilian native tree that produces vibrant red flowers and is best utilized as a windbreak/bird and bee fodder. Everyone at the seed swap was incredibly friendly, enthusiastic and excited to learn or teach given their level of experience. Next we went to a community screening of Inhabit, a documentary film showcasing North American permacutlurists and their properties. This film was hugely inspiring. There were projects and properties ranging from small urban settings up to a 106 acre organic farm in Wisconsin, all of which were tremendously productive and successful. One of my favorite aspects about the film was the attention given to people care, many of the featured projects were community efforts to rehabilitate polluted or unused urban blocks, as well as one project in California that offered ex-convicts a unique opportunity to transform land and themselves. Also it was really amazing to see the enormous yields of healthy food put forth from the execution of permaculture principles and way of life. It is about more than being less bad, we can be a positive creative force for our planet, that is a really empowering idea and one that resonates truth. Lastly we attended a tomato planting workshop hosted by Nelson Lebo. In this workshop we learned about selecting tomato plants, how and when to plant them, strategies for obtaining high yields from early to late season, fast economic ways to train your tomatoes, as well as shaping and feeding your plants. Again the turnout was excellent and full of people eager to learn, and one or two with some useful tips of their own. All in all the Wanganui Permaculture weekend was a really amazing, positive experience. So much information was shared about an astounding array of subjects, and some furious note taking will ensure that most of it will be retained, or stored when it will be called upon at a later date. Seeing so much energy put forth to promote such a positive way of life that is Permaculture has been so inspiring, I can’t wait for myself and Kelly to get to work on our own project. We have enjoyed our time at the Ecoshool immensely and will miss all of our new friends and hosts, but fear not Wanganui we shall return.